The Weblog Awards were presented at the South by Southwest Conference today in Austin, Texas, and Gizmodo walked away with two Bloggies: Best Computers Or Technology Weblog, and Best-Designed Weblog. We'd like to thank all the wonderful people who voted for us, especially those visually-impaired folks who thought we had the best-designed weblog of the year. 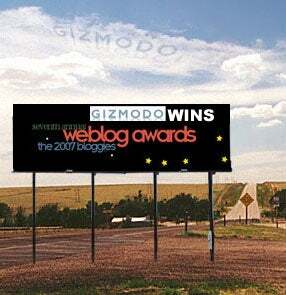 It's a great honor to accept these Weblog awards! Jump for all the winners and nominees!